This makes sense. After all, when you’ve had 30 years to get used to something being the way it is, it can be harder to let go than if you’ve only had three or 13 years in that reality. I have repeatedly heard stories of children who refuse to speak to one or both of their parents when they decide to split. Some children side with the “wronged” parent, especially in cases including “infidelity.” Others simply feel the need to side with someone. I have heard of one woman who stopped communicating with her father when her parents divorced, because she simply “could not do that to Mom.” This was the case even though Dad continued to provide her with financial support. I was a child when my parents split. For the last 30 years the closest thing that I’ve known to their acrimony is when the family gets together and they have some political disagreement. And when those occur, I really could care-less. Overall they get along, We all have some Sunday dinners, and travel together. And my dad has remarried (she is definitely welcome and comes too). So, how do we make divorce easier on our children? We set more realistic expectations for them about love and marriage so that they don’t feel like their lives (and your love) were all a big lie. This means dropping that tone of holiness that some parents attempt to project around fidelity, the sanctity of marriage and lifelong love. The truth is that half of all marriages end in divorce, and that’s OK. Legal marriage doesn’t have to last forever for it to have been real and meaningful. So, let’s stop teaching our children fairy tales that just leave them befuddled and angry when reality slaps them in the face later in life. How do you do this? Make it clear that you love your spouse but that there is always a possibility you may split in the years to come. Also, when people that you and/or your children know get divorced, explain that this does not mean they are bad people, bad parents or even bad spouses, but simply that sometimes marriages don’t last a lifetime. Many children will, at some point, ask their parents, “Are you going to get a divorce?” This could happen because their friends at school have parents who are going through it, or maybe just because they hear you fighting. Instead of saying, “Of course not,” explain that this could happen one day, even if your marriage is great at the moment. If you believe that you or your partner might stray at some point (and maybe even if you don’t believe it, as people often think they’ll never do it … until they do), show compassion for yourself and/or your partner. If someone in your family or a friend deals with infidelity as a part of a break-up, resist the urge to say things like, “I can’t believe he would stay with her after she cheated on him” or “It serves him right that she left him after he did that to her.” Instead, explain to your child that every person deserves to be able to make their own decisions, even if those decisions hurt other people’s feelings. After all, even the most compassionate decisions have casualties. Talk about compassion and the fact that none of us is perfect. Teach your children not to judge people based on what they do in their marriages. And if your parents suddenly announce that they are ending their long-standing marriage (for whatever reason) remember that both of them probably need your support through a critical change in their lives together. Admittedly, you have a stake in their relationship, and you may be hurting and needing support as well. But they are the primary players. Show as much compassion as possible and stay out of their stuff. After all, a Powerful Person in a Partnership understands that we must all be true to ourselves first and foremost … and that includes your parents. Frank, I appreciate your article…my son and daughter were 18 & 16 when their mother and I divorced. Today they are 33 & 30. I have not been able to establish a new relationship based on who I am and who they are outside of a twenty year marriage that had much acrimony. The more I have tried to communicate with them, the further they seem to want to be. It seems like they have anger at me and use everything I do as another justification for seeing me at fault. I know they have been hurt in the breakup and do feel responsible for understanding and seeing my part in bringing a solution. And yet, for the most part, it seems out of reach. I am thinking of forwarding your article to them and asking if they would be willing to tell me what rings true in it for them. Everything I have tried thus far hasn’t worked, and, I do feel gun shy. I hope some feedback from you and/or this group could help give me some clarity. They (my adult children) communicate with their Grandmother (my mother) their aunties, uncles, and cousins, yet choose to be closed to what it would take for them to be willing to talk with me. The family is concerned, yet no-one seems to have a key to fit the door. This is a subject that falls under “Finding ones self”–If you will look on YouTube under Peoples Church of Divine Prophesy, you will find a video of the speech I make as the Sunday message that applies to adult children and parental divorce. I am Nellie, and it was filmed in Aug this year. A related issue I have seen is Adult-Child Anger when parents date or remarry. Children are unable to cope with adult changes as well as most adults think that they can. This is due, in part, to their limited skill set in coping with life at their age. Does life exist in a bubble? ; of course not. Children can be exposed to divorce through their own family, the family of a friend, or relative, and more as you have pointed out. Attachment and bonding are such critical things for a child to develop. Can divorce disrupt this from continuing? Counseling can assist a family in looking at these tough issues. Unfortunately, it does not appear that many are seeking these services. Interesting topic and helpful insights Frank. What I have been finding in my energy healing work is that divorce (and of course other traumatic experiences) create Trapped Emotions. Once an emotion becomes trapped in the body it tends to stay there, often times for YEARS. While there, it causes the body to resonate with that same energy, resentment or anger for instance, causing the person to then attract or perceive more of the same. This seems to be what Merv is experiencing. Because his kids likely trapped emotions of anger and resentment during the divorce, in all the passing years they have continued to attract matching emotions. Now whatever he does continues to be perceived through that same ‘veil’ of anger and resentment! Much like the proverbial ‘rose colored glasses’ … only these are black ones! So while I think Frank’s idea is a great ‘pro-active’ approach, for those that it comes too late … I would highly suggest the Body Code for ‘damage control’. Though the topic of discussion is divorce, this healing modality is helpful for addressing ANY previous ‘experience’ holding you back from moving forward. Yes, I agree we need to talk more to our children when divorce or separation transpires. Yes, I believe we need to provide age appropriate information about what has happened and how it will affect the child. Yes, I think teaching our children not to judge the people involved or their actions is a good idea. My step son has just been through his mother separating from a man he has known most of his life. His biggest fear off the back of that is that his Dad and I will also part company. We are his stability right now. The place he can be sure is ‘normal’ and as it always was. Telling him that we might also divorce would be a sure way to make this child doubtful and untrusting of every single adult around him. 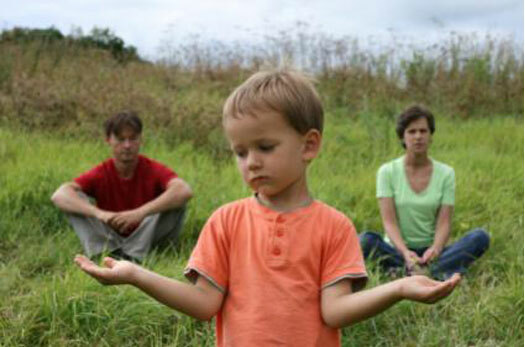 Children can gain perspective after a separation (or even after a bad argument) by letting them know that sometimes adults just can’t make things work, but telling a child that there is a possibility that you may fall out of love and need to be apart in the future give thems every reason to believe the same might befall them too. Why burden a child with the worry of what MIGHT occur in the future? Let them live as children. Let them face their challenges in the moment, not for days, weeks, months or years before. This is a great way to frame the break up of a relationship/divorce to children. Nowadays there are no guarantees that parents will stay together, and you’re correct to say that it is better not to set expectations for the child as such (or for the parents). I wonder if this is what is more “natural” for relationships without the social/religious pressures to remain committed for life (though I do value the idea of marriage lasting). I totally agree with you. I honestly think that it’s better for parents to divorce and be happy and be able to be civil to each other than to stay in a marriage just for the sake of the kids. Eventually, the kids will pick up on it, and then they will feel guilty as adults for being the reason their parents chose to remain unhappy. The older I get, the more I understand why marriages fail and why people ultimately divorce. Getting divorced does not mean you did anything wrong in the marriage. People change, and sometimes you just have to move on! As therapist, by the time that I come in contact with the parents and child(ren) I have not been givent the op to set the expectations of what and how long a marriage/relationship it is reasonable to last. My role is to aid the child(ren) to begin the healing process. I have to accept that my role comes with some limitations and to theorize about having the ability to be on the ground floor, well that is not where I enter the journey. Anger, disappointment, sadness – these are some to the issues that my role allows me to address. However, if I were enjoined earlier I might have an op to create different thinking about marriage itself. I disagree with several approaches you take (as a therapist of 35 years, as a parent, as a divorcee after 30 years of marriage)–I think that you are too defensive of those who might have chosen to end commitment relationships because they have chosen to betray or abandon their partners. It smacks too much of “most is forgiven because, well, people make mistakes”–I think that’s for carwrecks and dropped egg cartons, not smashed relationships and families. I do think it is ok to say to children (of all ages)–people who divorce can’t be friends, love each other, and solve problems together the way they wanted to when they got married–that is, after all is said and done, always the bottom line. As for telling children along the way “someday we might get divorced” I think that is akin to telling children “someday awful robbers might break into this house any time they want because they can”–NOT what children want/need to hear–they need to have a sense of bounded safety and permanency. AFTER a divorce is plenty of time to spout platitudes. [And what IS wrong with people who are the hurt partner being able to be, well, the hurt partner? Or to be angry for a friend or relative who is a hurt partner? I don’t see what’s wrong with a little honest human emotion aobut inappropriate behavior, including sadness and worry about a friend or relative who has become an unfaithful partner.] I do agree, though, that it’s ok to teach our kids (who are surrounded with divorce as a topic all the time) that: sometimes it happens, it IS sad and disruptive but people and families get better. Just sayin’. . .